So my difficulty began yesterday because we got the remake of “The Evil Dead” from Netflix in the mail, and my elderly mother-in-law is living with us right now, and we try to keep that sort of thing out of her line of sight. So my wife ran to Red Box and brought home “Les Miserables,” and I knew I was in for trouble. I never saw “Rocky” or any of its several hundred sequels because I tend to run the other direction when a movie gets wildly popular, and I start hearing about how people cried and cried. I hate most sentimentality like fingernails on a blackboard. And musicals? If it doesn’t have Mickey Rooney and Judy Garland in it, putting on a show to save the nation – that it to say, deliberate kitsch -- I’m rarely interested (although I sat still for “Chicago” and was impressed by its cultural depth). Musicals generally take me in a direction I’m unwilling to go. 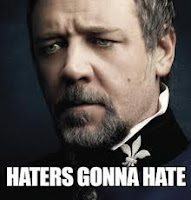 Grown men suddenly breaking into song can make my skin crawl, and unfortunately in “Les Mis,” where virtually every line of dialogue is delivered as high opera, the initiator of this singular brand of unreality is ole Maximus Decimus Meridius himself, Russell Crowe. I suppressed giggles last night, which could have gotten me banished from the room right off the bat. Okay, okay, I got used to the singing, and I’ll even admit that the music was pretty good, in its own romantic and bombastic way (though I now cuss that I’ve got “Master of the House” as an earworm, like George on “Seinfeld” in that episode about Jerry’s new suede jacket), and the acting was very good indeed. It’s the politics of the story that I ended up hating (and this is a political blog, O my Brethren), especially that flag-waving on the barricades at the end, but acknowledging how popular this movie was, it would be so rude of me to say anything bad about it. About how conservative the underlying message really was. Take the story arc of little Cosette, the poor little orphan waif who’s scooped up by the merciful Jean Valjean and who learns how to be prosperous and in the end gets married to the rich guy in a sumptuous society wedding. Revolution be damned! It’s the same plot of how many sentimental Victorian novels that excuse poverty and oppression by marrying off the poor little heroine and making her a part of the 1%. Poverty and oppression remain safely the law of the land, and wedding planners get plenty of business. In a story ostensibly all about revolt, rebellion, resistance to oppression, and recognition of injustice, the central hero Jean Valjean, a.k.a. Hugh Jackman, remains amazingly aloof to the politics around him. I get it that he’s a symbolic representation of mercifulness, as opposed to Javert’s law-without-mercy, but Valjean really never takes a stand about the revolution percolating around him. In fact, Jean Valjean seems to have an almost magical ability to become prosperous and bourgeois between bouts of fugitive flight, becoming mayor of Montreuil-sur-Mer and owner of multiple factories. After every desperate escape from The Law, he’s always rediscovered well dressed and with plenty of spending money. He saves young Marius from the barricades, not because he’s in agreement with the revolution but because his adopted daughter is in love. That young Marius (Eddie Redmayne), who was saved from the barricades via a trip through the sewers, reinserts himself into the comforts of the 1% with amazing ease, I thought. Meanwhile, all the young revolutionaries and his erstwhile best buds are dead, and the tyranny of the rich and of an unjust state are reasserted. Nothing has changed. Except that Jean Valjean is being welcomed into heaven by the singing ghost of Fantine, which is where I really got mad. How many centuries have the poor and oppressed been placated by the promise of a reward in heaven? I ain’t buying it. It’s ultimately a doctrine that sustains the class system and keeps the powerless from pushing back. "Heaven, my dears! Think only of heaven. That's where you'll get universal healthcare!" Meanwhile, we’ll keep the cruel status quo very safely ensconced on earth. What’s left then? The movie ends with the ghosts of the defeated revolution waving banners from the barricades. Why? What for? Nothing’s changed. And we’re encouraged to weep sentimentally for deaths we should be burning to avenge. But I won’t talk bad about “Les Mis.” We can’t help it that the source material was written by Victor Hugo instead of Maxim Gorky and that American audiences still love sentiment more than justice, more than cinnamon toast. Labels: movies, revolution in the U.S.